This brown practice football features the University of Michigan "M" drawn on it and the memorial text in silver ink of "Gerald R. Ford / A True American / and hometown / hero." The ball, made by Wilson, is official size. 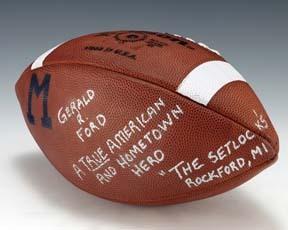 Julie Setlock left football at President Ford's memorial.